After the extraordinary success of A Year with Marmalade, another new adventure is here with Marmalade the cat, and best friends Ella and Maddy, carrying themes of friendship and tolerance. The girls decide to build a cubby house while Marmalade keeps an eye on their activities. Toby from across the road scooters over and their pink cloth is swept off its stick poles. They try again. This time they build an elaborate sandcastle city. But here comes the disruptive Toby again. It seems that catastrophe follows where ever Toby goes, for that’s not the end of it. The incident with the tap follows, which scares Marmalade into a tree. How will they ever get him down? Toby shows that he has good ideas and proves to be very resourceful. 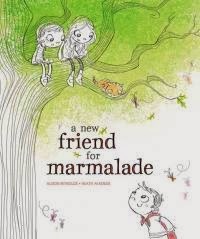 After finding the ideal solution to getting Marmalade down, Ella, Maddy and Marmalade discover that new friends are found when you least expect it. The illustrations by Heath McKenzie are delightful. His impressive style of minimal colour to the pictures is very effective. It allows the characters individuality and expression, while accentuating the main features of the story. Marmalade is certainly charming everyone!